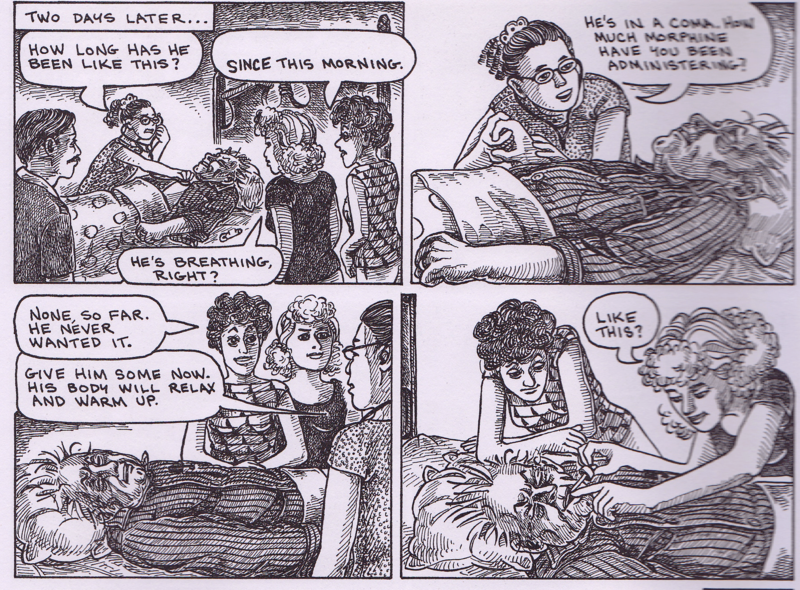 The theme of this year’s Graphic Medicine Comics Forum is “Visualizing the Stigma of Illness.” Stigma in illness often arises simply from close association with death. 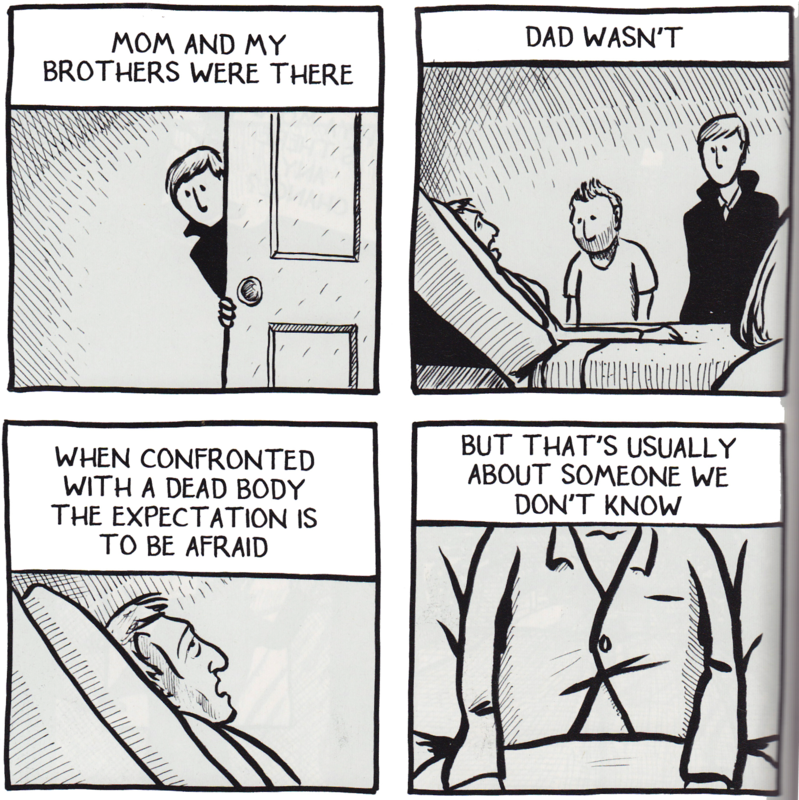 Dying is frequently an integral plot element in medically themed graphic novels and memoir, but it frequently happens “off-panel” thereby avoiding challenging visual representations of death and dying. There are notable exceptions to this, of course, such as Lisa’s Story: The Other Shoe by Tom Batiuk (Kent State University Press, 2007). ‘Lisa’s Story: The Other Shoe’ by Tom Batiuk, p.218. Image used with the permission of the creator, who holds the copyright. Click image for larger version. 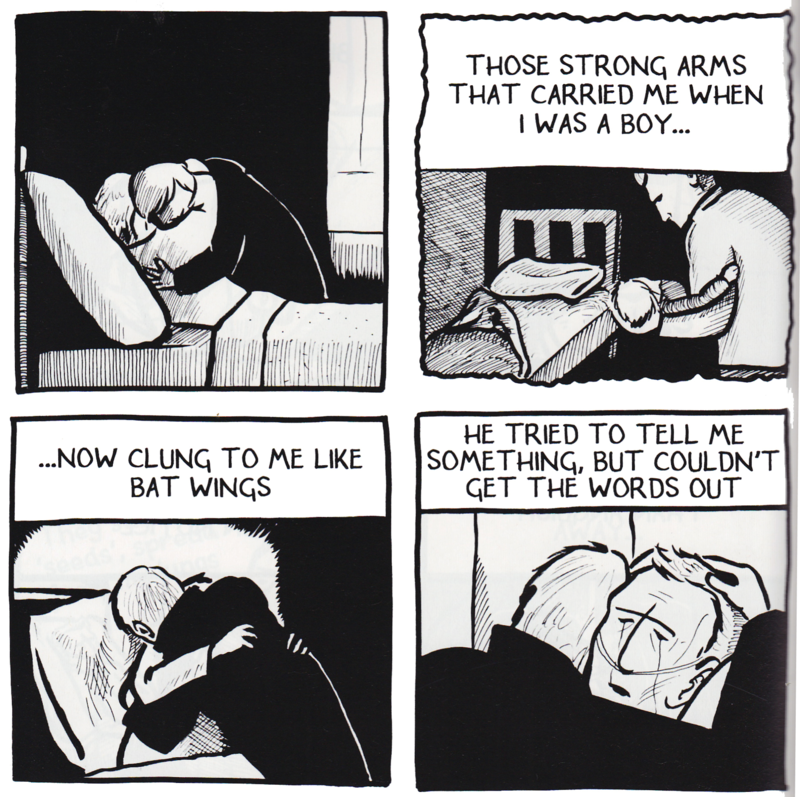 Three notable graphic memoirs published in 2011 visually portray dying and death. To this hospice nurse, these three representations of family hospice experiences struck me as refreshingly honest. They portray the kinds of experiences I’ve witnessed professionally but not previously seen presented in graphic narrative, and they stayed with me. Each is intimate, honest, and, I’m guessing, was challenging to produce, as in each book, the creator is presenting the death of their parent. In Seeds by British artist Ross Macintosh, (published by Com.x) Mackintosh’s father is dying of cancer. ‘Seeds’ by Ross Macintosh, p.56. Image used with the permission of the creator. Click image for larger version. Ross is summoned during the night. His father has died. ‘Seeds’ by Ross Macintosh, p.62. Image used with the permission of the creator. Click image for larger version. 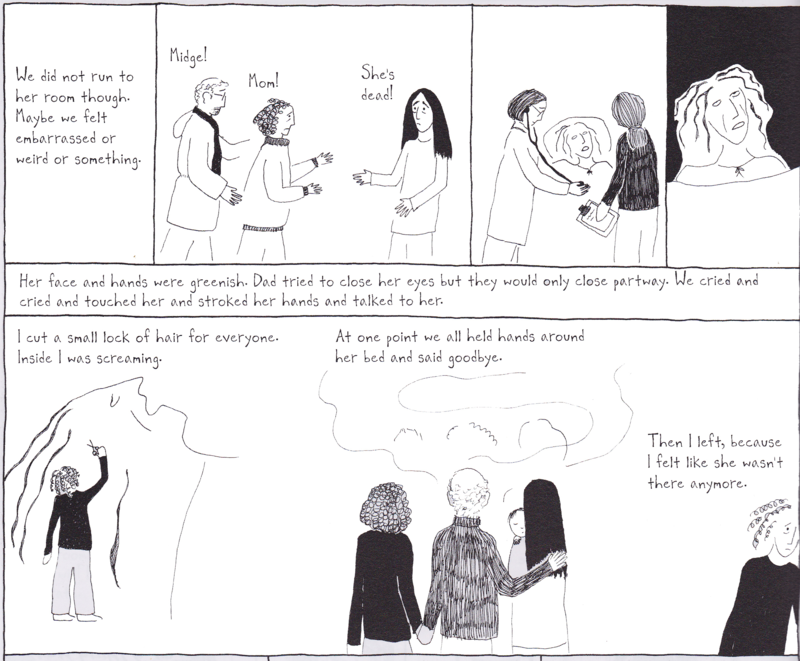 Depicting a character, particularly one’s own parent, after death, is not something the norm in graphic texts about illness, and Mackintosh does this beautifully in Seeds. The simple graphic sensibility of the book is in stark contrast to the emotional complexity of the content. In addition to drawing his own dad moments after death, Mackintosh confronts in the text of this section the existential nothingness that is death, avoiding religiosity and spirituality. 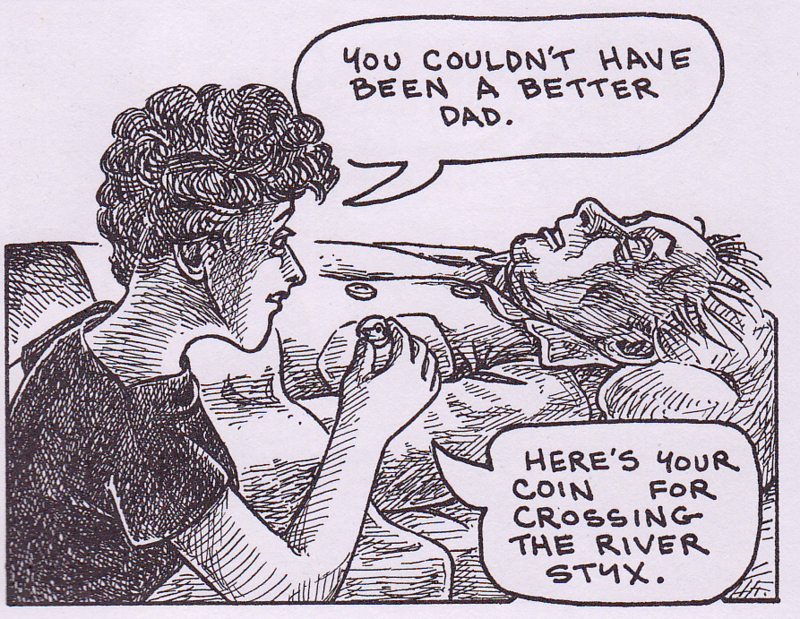 Further in the panel shown above, for example, he compares his dad’s body to a cut toenail – an artifact of life that no longer carries meaning. I found this treatment of death bold and refreshing. 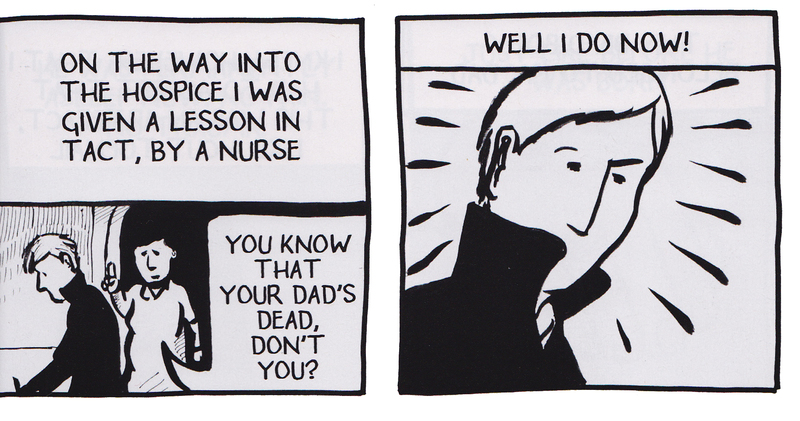 In Special Exits by American underground comics artist Joyce Farmer, (Fantagraphics) the protagonist character (meant to represent Farmer) is not present for the death of her mother, because the nursing home staff failed to make contact with her in time. ‘Special Exits’ by Joyce Farmer, p.150. Image used with the permission of the creator. Click image for larger version. When it is Farmer’s father’s time to be in hospice, she seems committed to being with him, and showing us, every arduous step along the way. ‘Special Exits’ by Joyce Farmer, p.195. Image used with the permission of the creator. Click image for larger version. ‘Special Exits’ by Joyce Farmer, p.196. Image used with the permission of the creator. Click image for larger version. She is not present for the actual death again, but is with her father moments after. ‘Tangles’ by Sarah Leavitt, p.121. Image used with the permission of the creator. Click image for larger version. ‘Tangles’ by Sarah Leavitt, p.122. Image used with the permission of the creator. Click image for larger version. ‘Seeds’ by Ross Macintosh, p.61. Image used with the permission of the creator. Click image for larger version. Interestingly, each of these texts also point out things caregivers did that were remembered as less-than-helpful during a difficult time. For Farmer, it was the nurse not reaching her in time preventing Farmer from being present for her mother’s death. For Ross, it was the way in which a hospital staff member chose to inform him of his father’s death.And for Leavitt, less-than-helpful volunteers appeared shortly after her mother passed away. These unhelpful persons seem an integral part of the narrative of each death, burned into the memory of the storyteller for the obvious contrast they represent to what is needed by families at a time of loss. 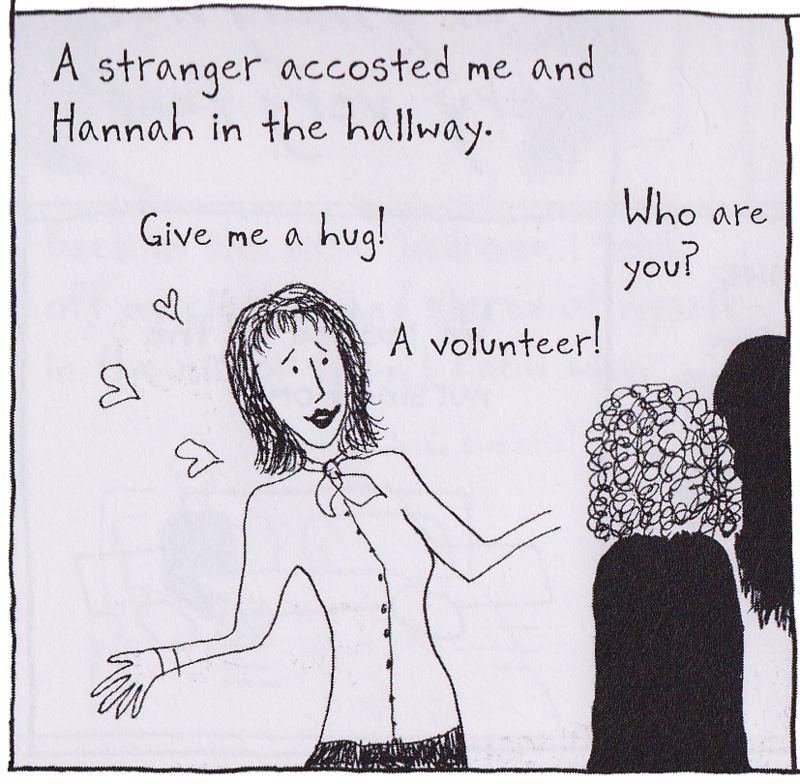 I created the comic for myself, as a way of removing pictures and phrases from the maelstrom in my head. The secondary purpose was a subconscious need to express to my mom and brothers that the awful events didn’t just happen quietly. For those of us who are readers of the texts, they help us to begin to think about the deaths we have encountered or will encounter, and give us models for how to (and perhaps how not to) approach them. We are discussing life and death, and not in the abstract, either… Now is not the time for verbal swordplay, for unlikely flights of imagination and wildly shifting perspectives, for metaphysical conceit, for wit… Now is a time for simplicity. Now is a time for, dare I say it, kindness. All image copyright belongs to the creators. 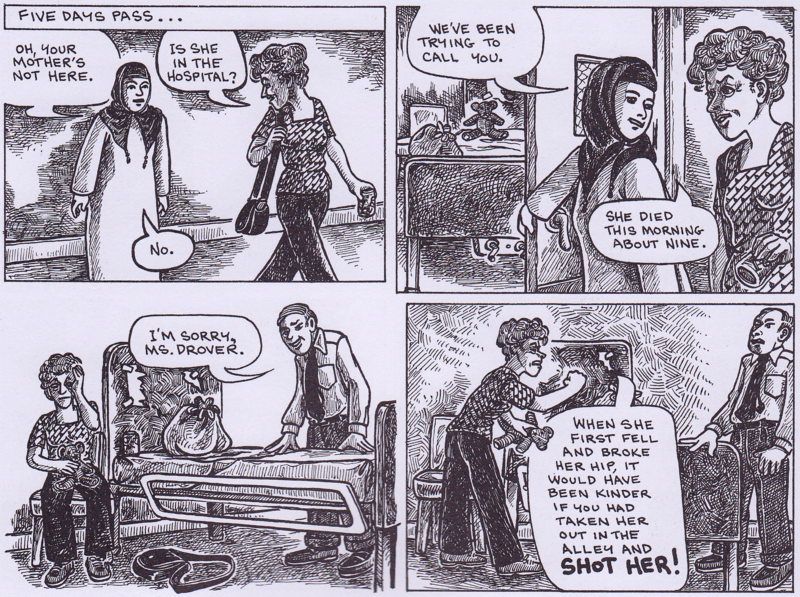 You can read previous editions of Graphic Medicine in the Comics Forum Website Archive. Comics Forum 2011 is supported by Thought Bubble, the University of Chichester, the Henry Moore Institute, Dr Mel Gibson, Routledge, Intellect and Molakoe Graphic Design.